The brick vaulted ceiling is the work of skilled bovideros in San Miguel de Allende who use no form… they just add bricks using a special mortar. 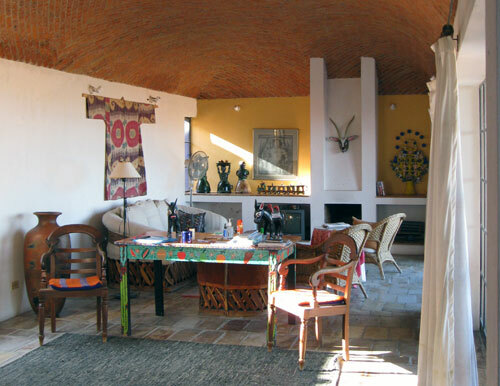 This is our living room with folk art and a grand view overlooking San Miguel. This entry was written by Margaret, posted on Nov 13th at 4:22 pm, filed under Everyday and tagged Add new tag, The Ceiling" the work of the Bovideros in San Miguel de Allende. Bookmark the permalink. Follow any comments here with the RSS feed for this post. Both comments and trackbacks are currently closed.